The Meshing Toolbox is a centralized collection of Femap’s geometry clean-up and meshing functionalities in a single pane. Below you will find an overview and demonstration of the included tools. Feature Suppression allows you to suppress loops, curves, and surfaces. Suppressed geometry still exists in the model and can be restored at any time. 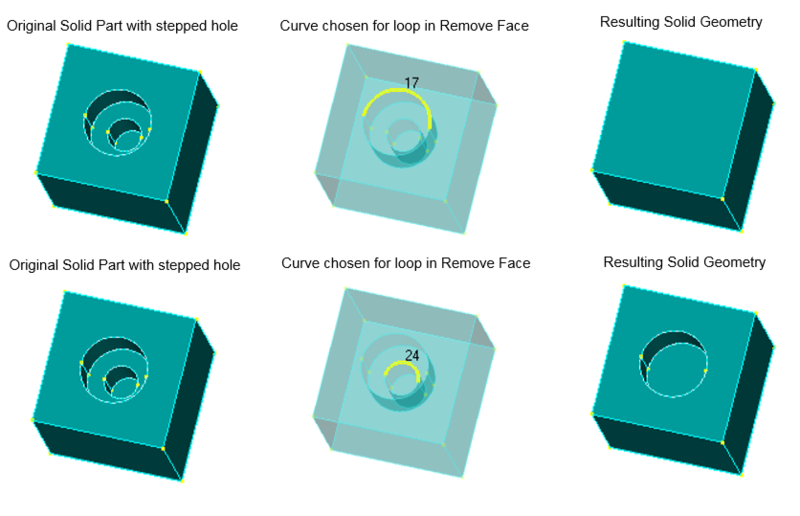 This tool aggregates Femap commands that permanently remove geometric entities, such as removing loops, surfaces, and curves. In the case of “Aggressive Removal”, localized geometry around the selected curve may be slightly altered to accommodate the curve no longer being part of the geometry. This tool is used to make relatively basic alterations to Geometric “features”. Examples include modifying the position of a hole, boss, or rib, changing the length/width of an extension or entire part, revolving a face to create an angled wall, or extending a revolved body, etc. Different operations require using the different Surface Selection Methods to select appropriate surfaces to be successful. Also, specifying a “realistic” translation or rotation vector is required. Operation – Determines which operation will be used to “split” or modify a curve or surface. Curve Break – Specificy a “Location to Break At” by entering XYZ coordinates or click the icon button to use the standard Coordinate Locate dialog box, then choose a curve to break. Point to Point – Select one point on a surface, then a second point on the same surface to create a line which splits the surface. Point to Edge – Select one point on a surface, then an edge/curve on the same surface to create the shortest possible straight line from the point of the edge which will “split” the surface. 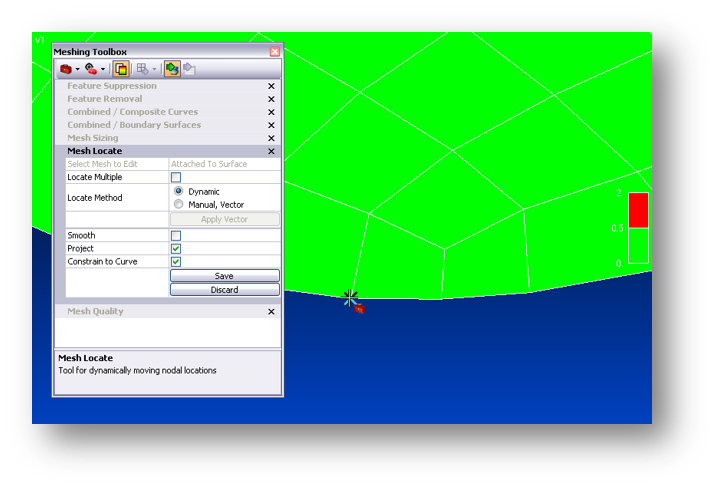 Edge to Edge – Select one edge/curve on a surface, then another edge on the surface. Lines, which follow the surface, will be created from the endpoints. Pad – Breaks the surface geometry surrounding a hole into four map-meshable regions. Washer – Uses offset curves to create map-meshable regions around holes. Extend – Extends the curve or surface to the point you designate. Project/Move Point – Projects a point or points used by a surface, solid, sheet solid, or general body onto an entity of the selected type. Project Curve – Creates a new curve or curves on the selected surface using a normal projection. 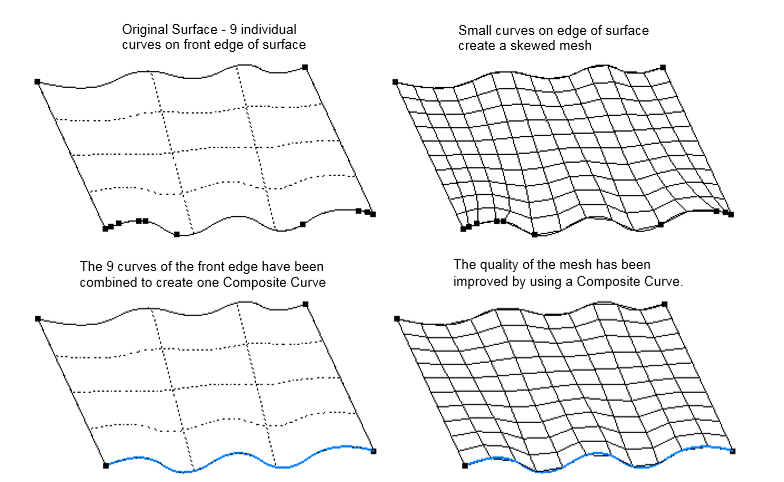 In some cases, combining serveral smaller curves along the edge of a surface will allow you to create a higher quality mesh on the surface. This tool allows you to combine curves by choosing the curves themselves or a point that two curves share. A “composite curve” will be created in FEMAP, which will be used for mesh sizing purposes instead of the underlying curves. 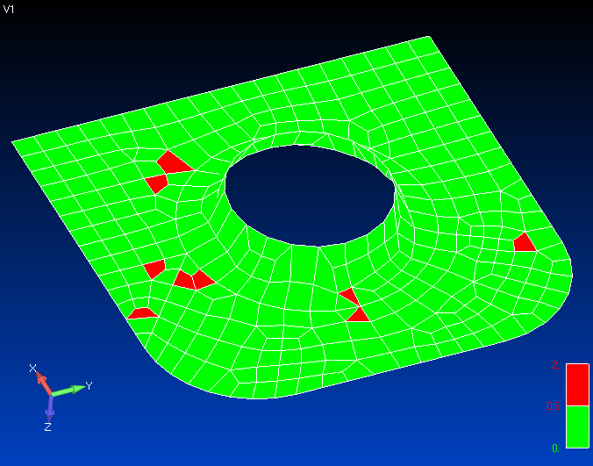 There are also options for splitting a composite curve at a selected point or removing any of the underlying curves. You may want to combine several surfaces into a “boundary surface”, such as when there are sliver surfaces next to a much larger surface. By combining the selected surfaces into one boundary surface, all of the internal curves can be ignored during the meshing process. 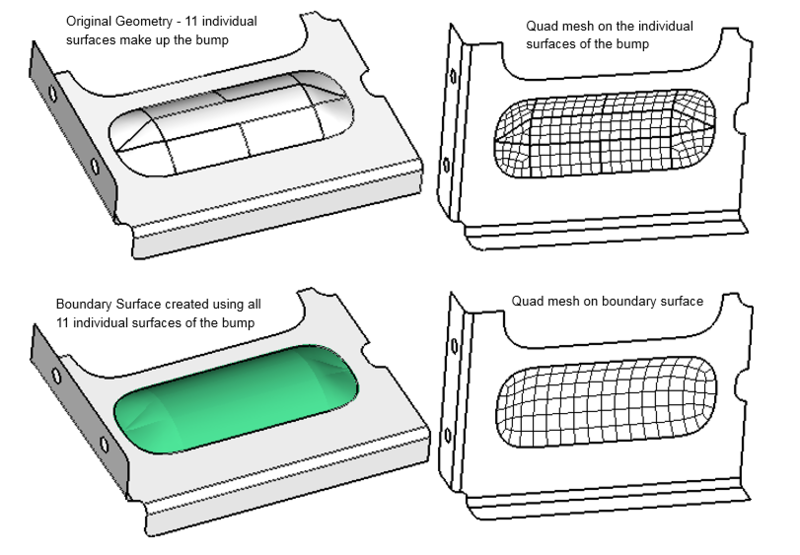 Boundary surfaces can be created by selecting a curve shared by multiple surfaces or choosing the surfaces themselves. Also, any underlying surface can be removed from a boundary surface or split along a curve. 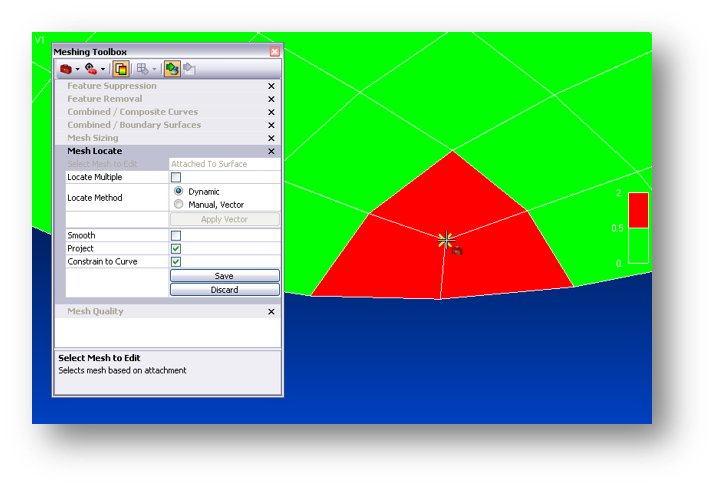 Modify mesh sizes on curves via setting, increasing, or decreasing the mesh size on selected curves, and includes the ability to match mesh sizes with other curves. 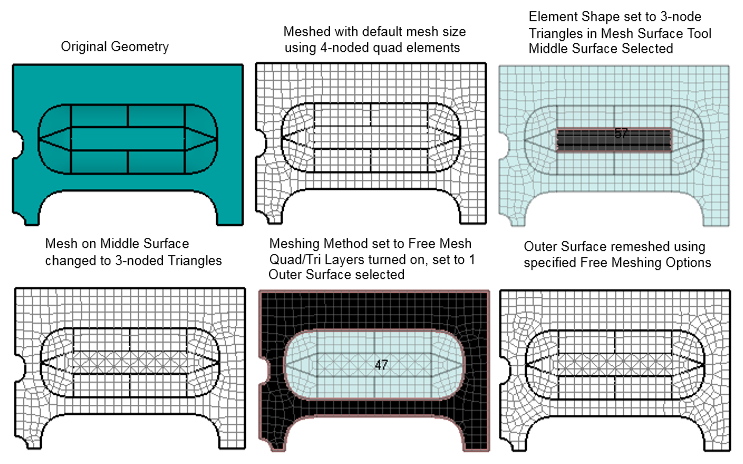 Mesh surfaces through free or mapped meshing with triangular or quad surface elements. 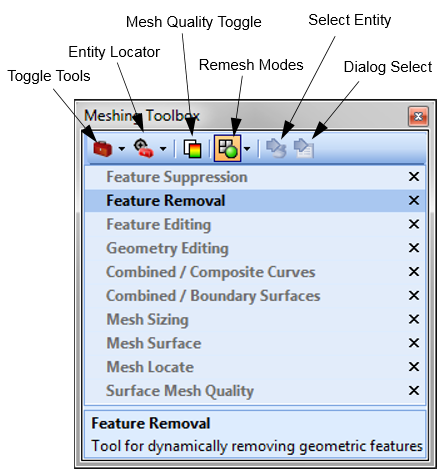 Allows surfaces to be meshed or remeshed “on-the-fly” using various surface meshing methods, options, and/or mesh approaches. There may be times when you would like to make small changes to an existing mesh simply by moving one or several nodes without changing the number of elements. This tool will allow you to do that while making sure that, as you move the node or nodes dynamically, they remain attached to specified solids, surfaces, and curves. If you have no geometry, it will follow the overall topology of the selected standalone mesh. There are also options to move the selected nodes by a defined amount, continually smooth the mesh as the nodes are moved, and allow the moved nodes to no longer be attached to surfaces or curves. When the Mesh Quality Toggle in the Meshing Toolbox is set to “on”, this tool allows you to graphically see an element quality value plotted on each element similar to a contour/criteria plot. There are several different element quality types which can be selected and each type has default automatic values, but user-defined values can also be specified. Also, the minimum and maximum quality values for the specififed “quality type” are listed in the bottom fields. Want to see the speed of the Meshing Toolbox? Request a live demo and we can show you how simple meshing is with Femap.